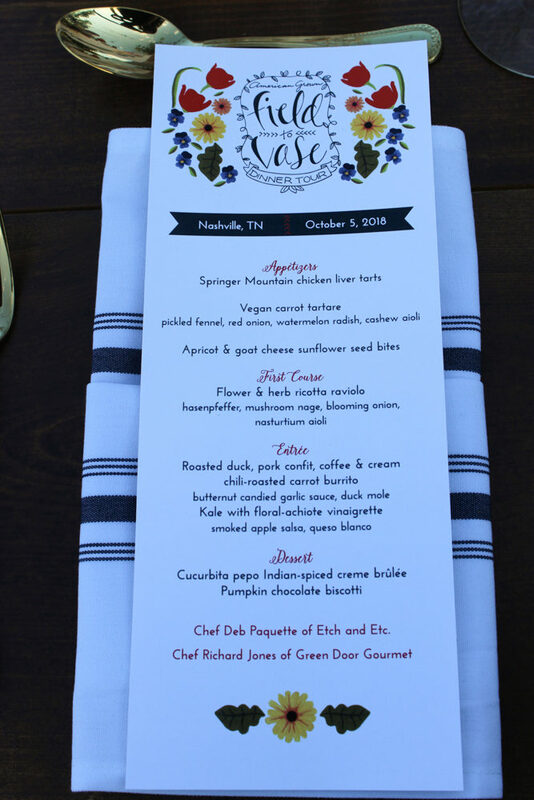 I was in Nashville this past Friday for the Field to Vase Dinner Tour, held at Green Door Gourmet. 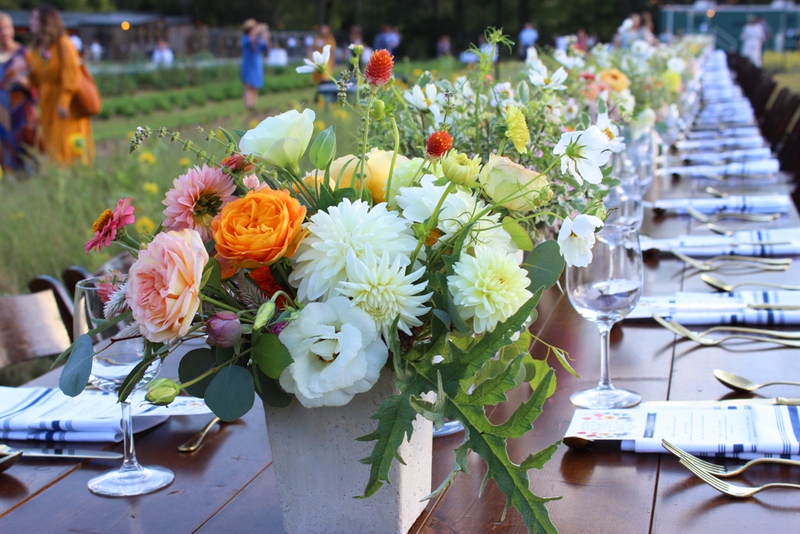 I have been wanting to attend a Field to Vase Dinner since I first heard of the program. When I learned that the tour would be coming to Nashville, I jumped at the chance to attend. 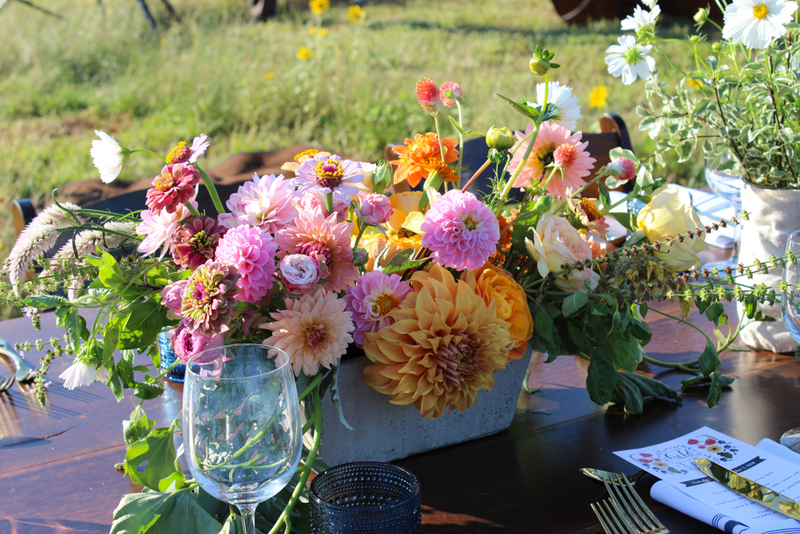 The Field to Vase Dinner Tour is held at six locations throughout the year and highlights the particular region and flowers grown on the farm where it is held. 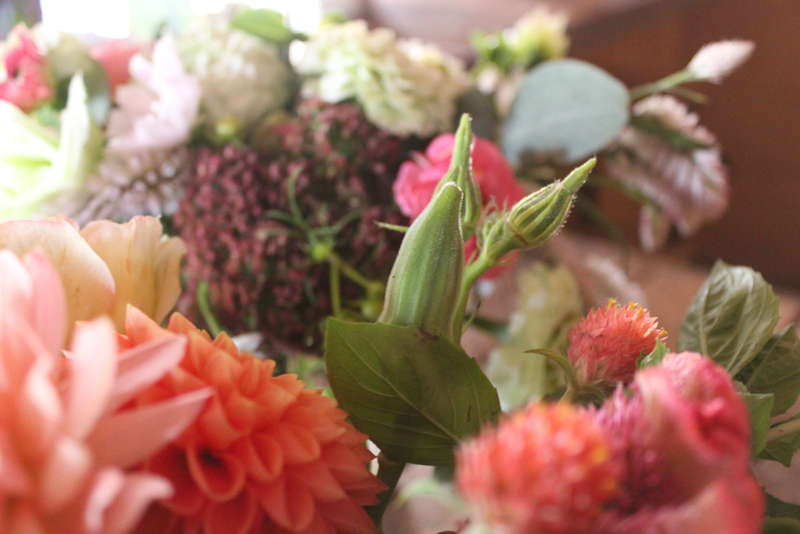 Using locally grown flowers is important to me for several reasons. 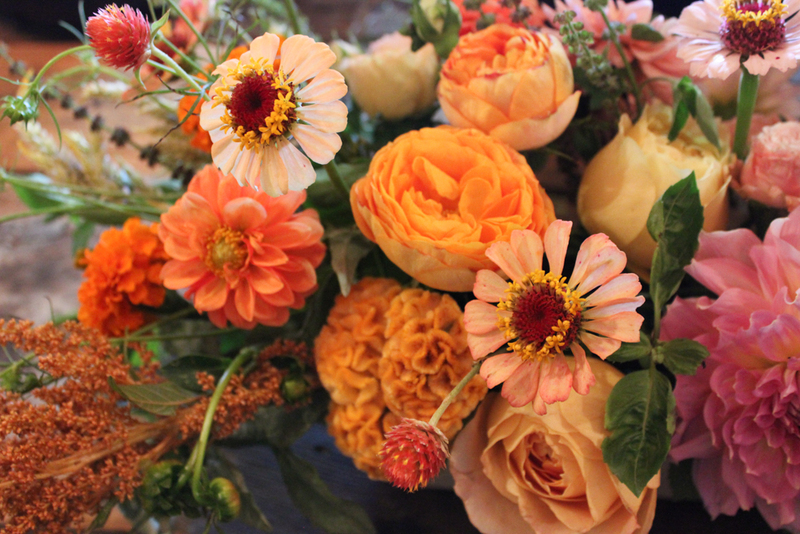 Locally grown flowers are fresher than flowers that have been imported. 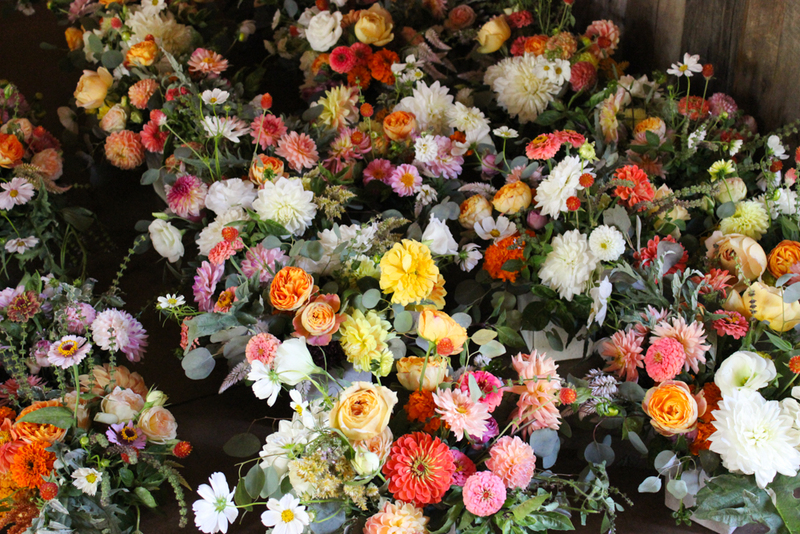 Locally grown flowers are often more unique than what is available through a floral wholesaler because of shipping constraints. 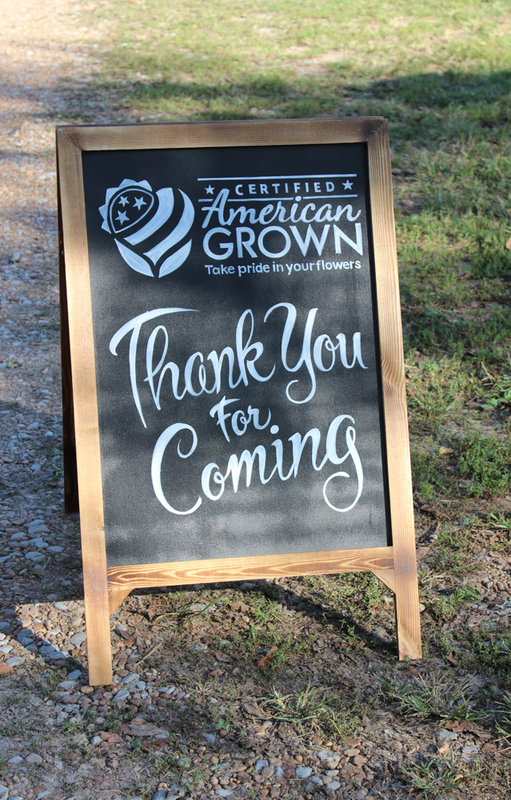 I value the relationships I have with local growers and believe in the shop local movement which puts more money directly into our local economy. 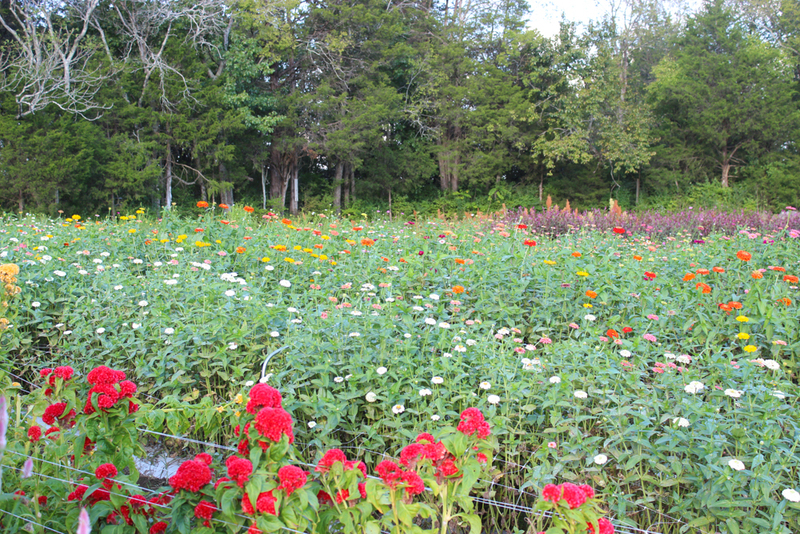 Because Nashville is in the same gardening zone as Evansville, many of the same flowers are available at our local farms. 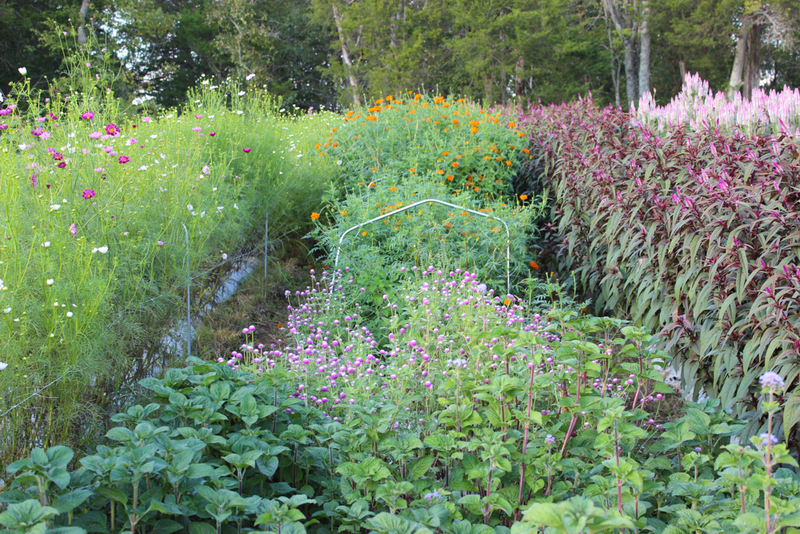 But, I was able to see new varieties and learn about farming on a larger scale than our local farms. Okra as filler! I love it! 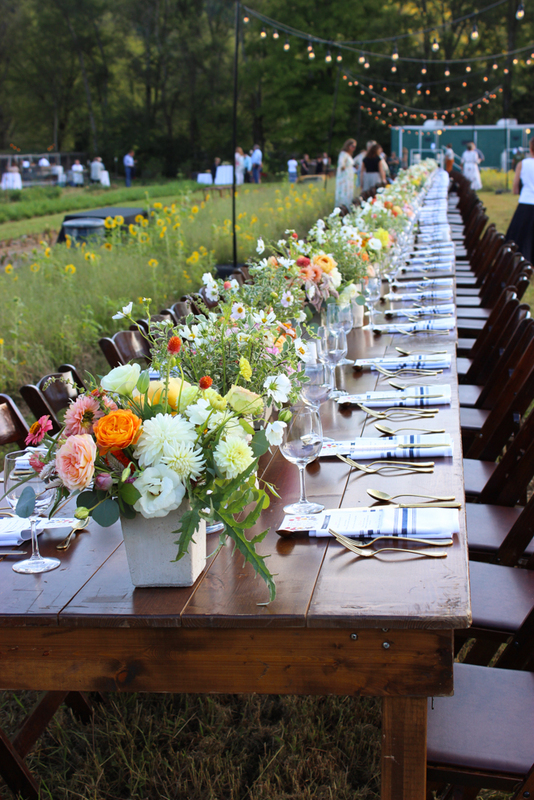 Touring the farm and attending the dinner would have been enough to make my experience complete. 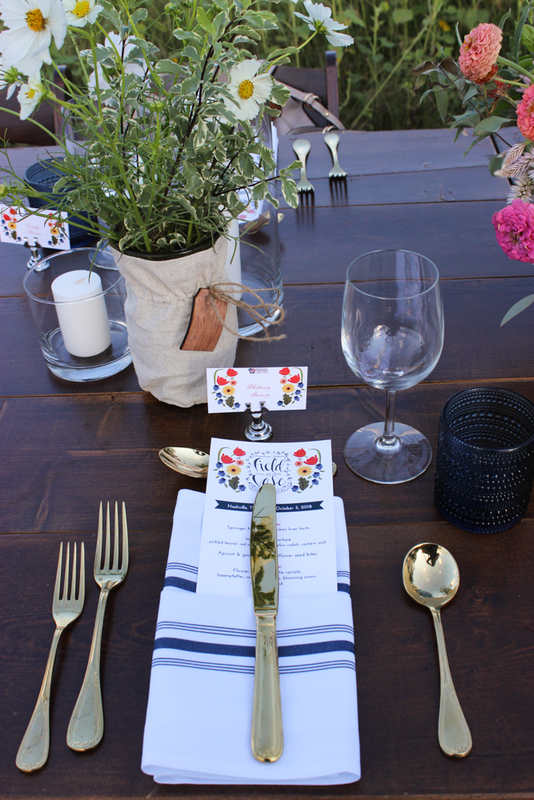 But when I learned that I would have a chance to design for the event, I had to take the opportunity. 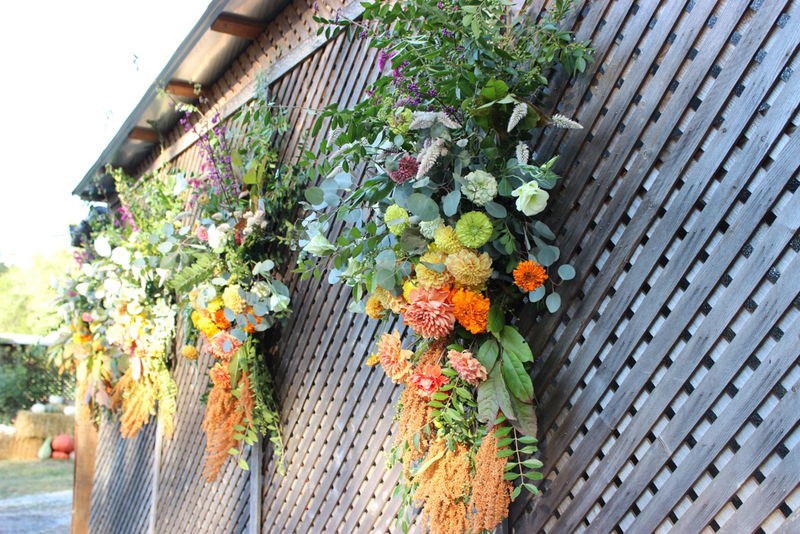 Kelly Perry of Team Flower led the design team for the event. 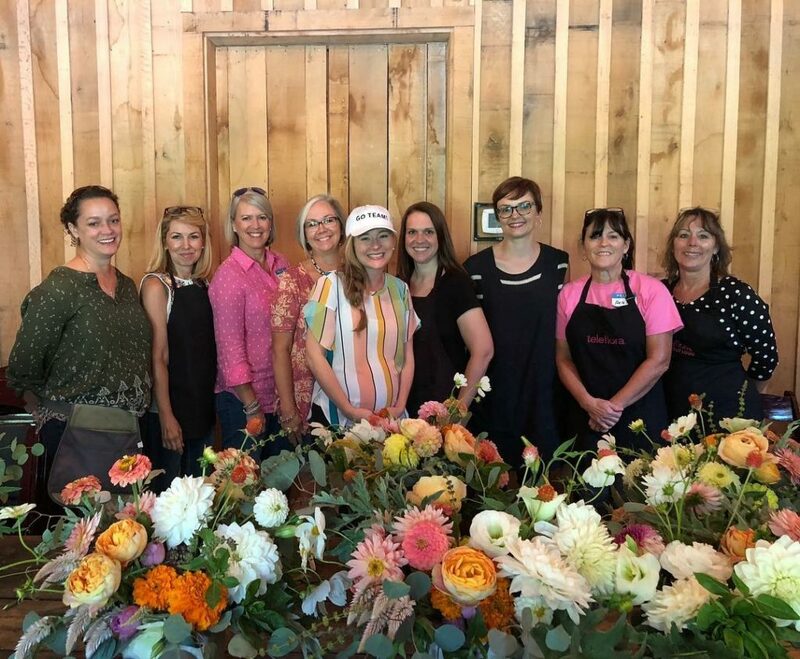 Team Flower is an educational platform, of which I am a member, that offers classes and instructional videos in all aspects of the floral industry. 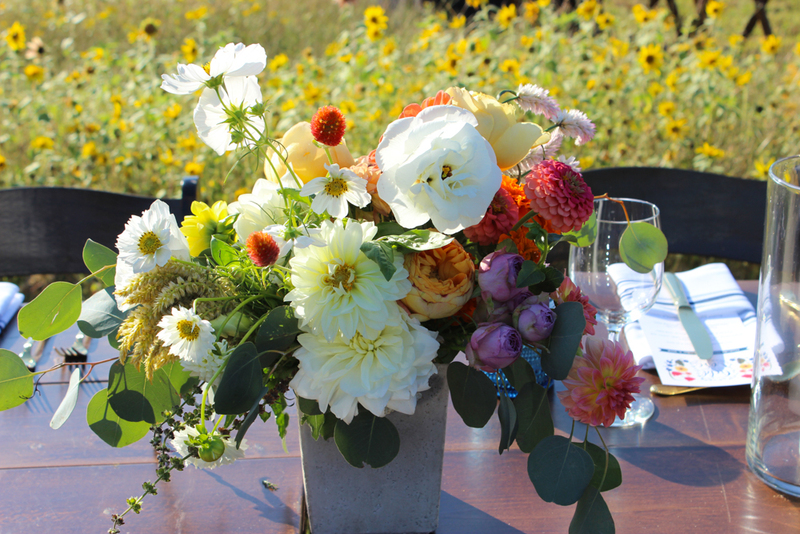 Nine Team Flower members, with Kelly’s instruction, created unique color-blocked centerpieces for the dinner for 200. 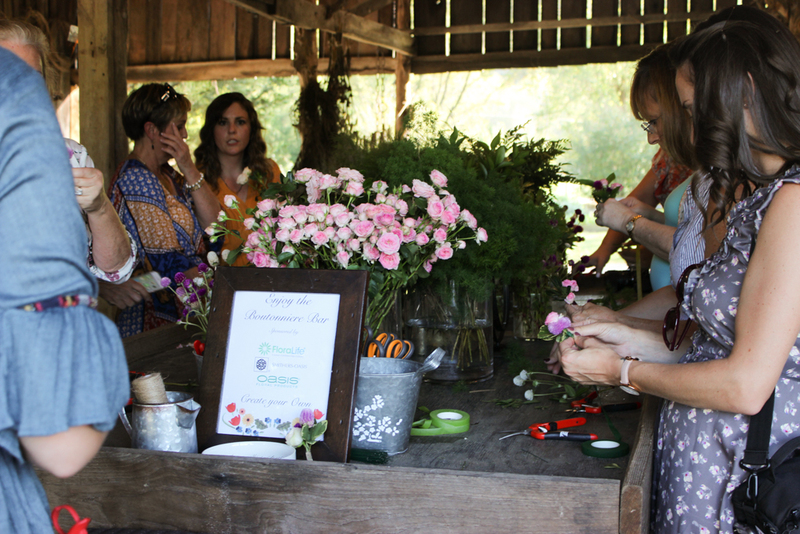 One of the best parts of the event for me was meeting and talking with these ladies about their businesses which ranged from flower farms to studio designers to brick and mortar floral shop owners. 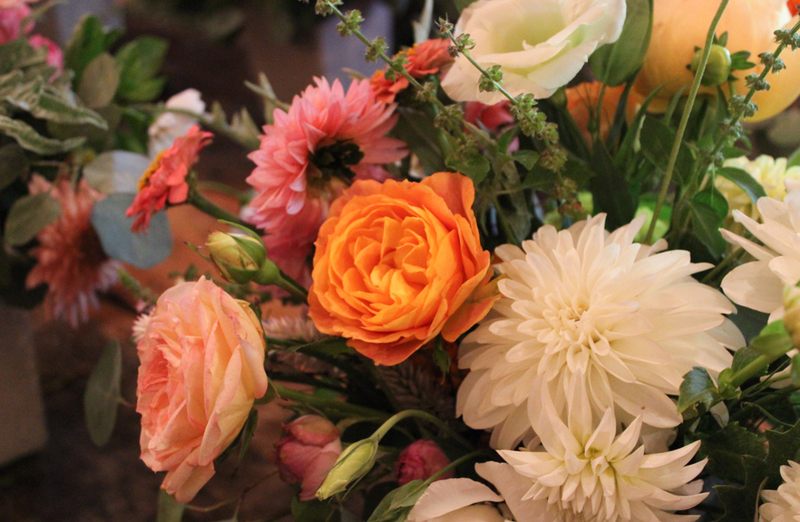 All of the flowers were grown at Green Door Gourmet with the exception of the roses, which were also American grown. 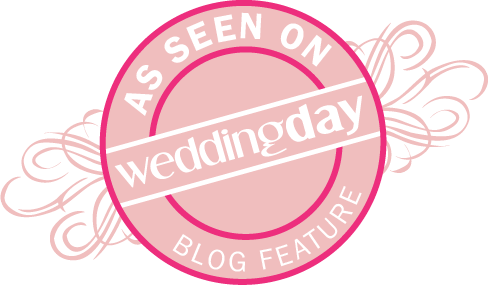 It was some of the most beautiful product I have ever worked with! 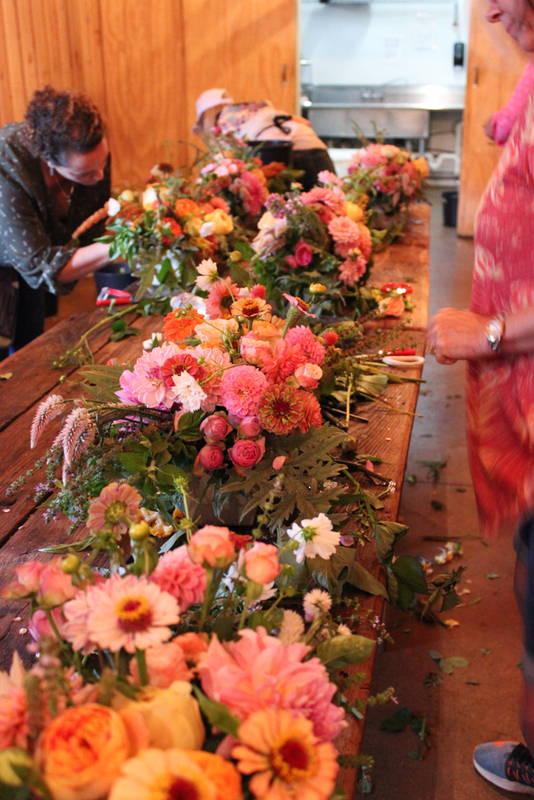 We were given gorgeous dahlias, the largest lisianthus I have ever seen, zinnias, celosia, cosmos, marigolds, gomphrena, amaranthus, sedum, and garden roses. 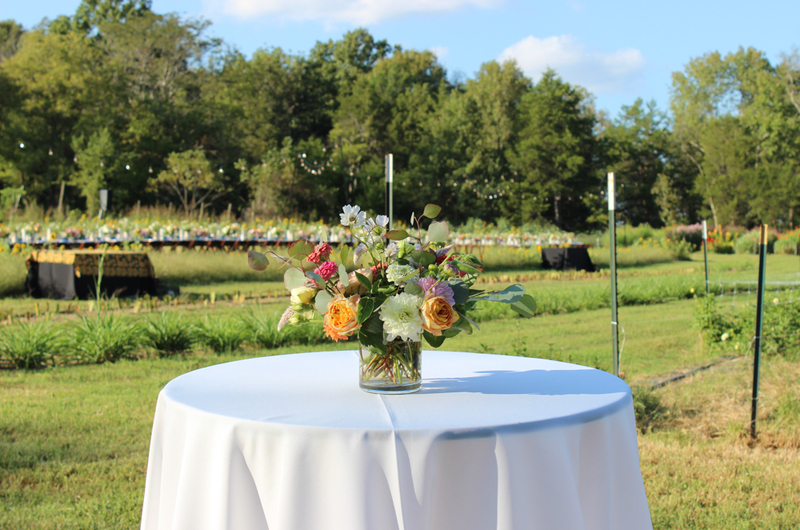 Foliage included eucalyptus, privet, artichoke, sweet potato vine, okra, and basil–which made the arrangements smell fantastic! 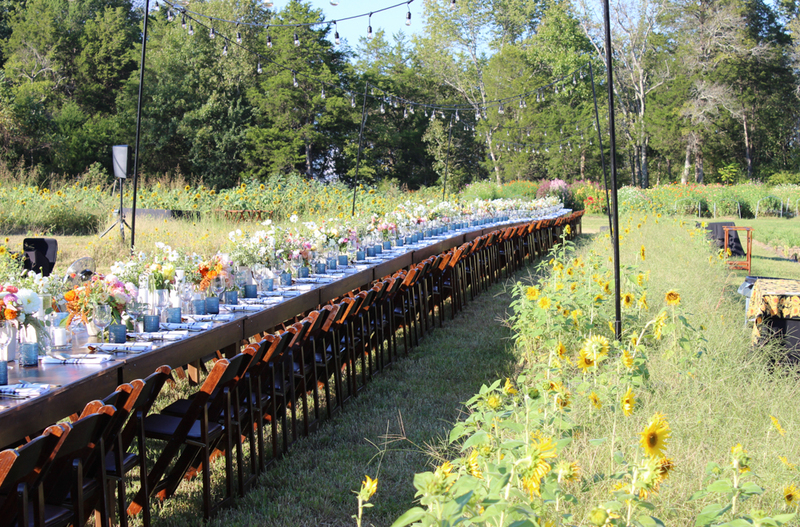 A long table was set amongst sunflowers with three types of arrangements. 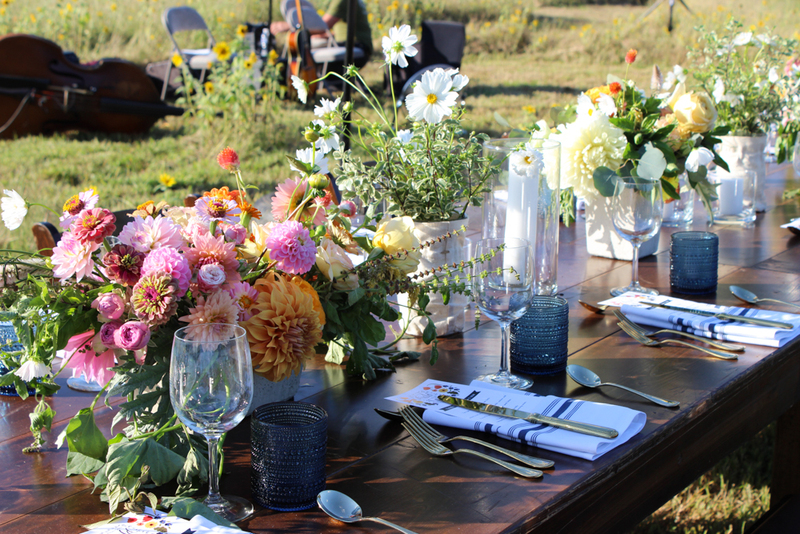 Rectangular and square containers were filled with colorful flowers with cylinders of white cosmos and candles between. 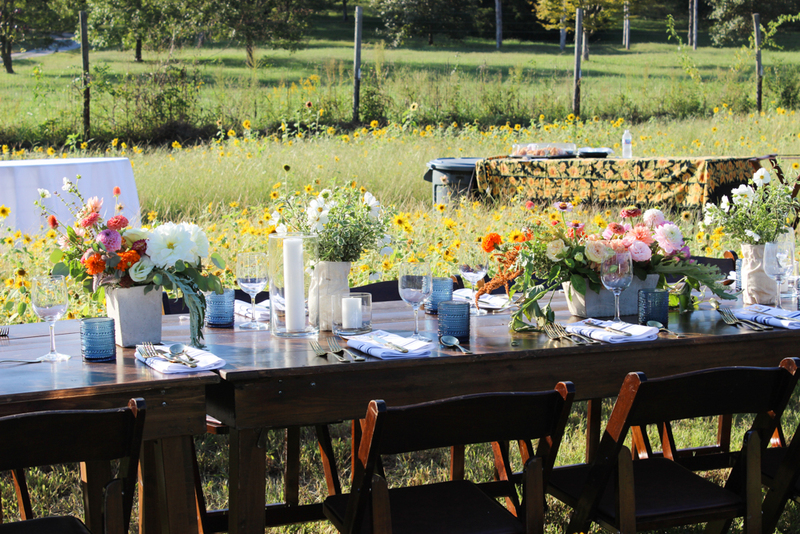 The abundance of flowers showed the meaning of the gathering. 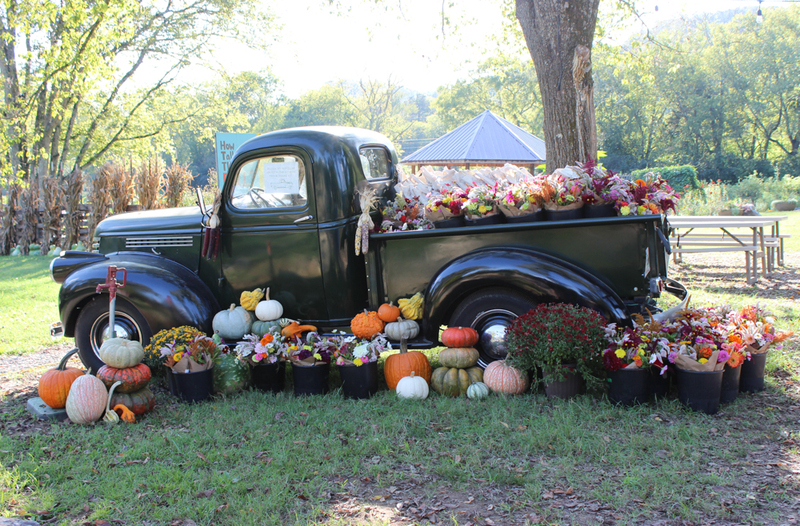 Guests arrived at the picturesque farm and saw the vintage truck filled with flowers and favors that would be passed out at the end of the night. 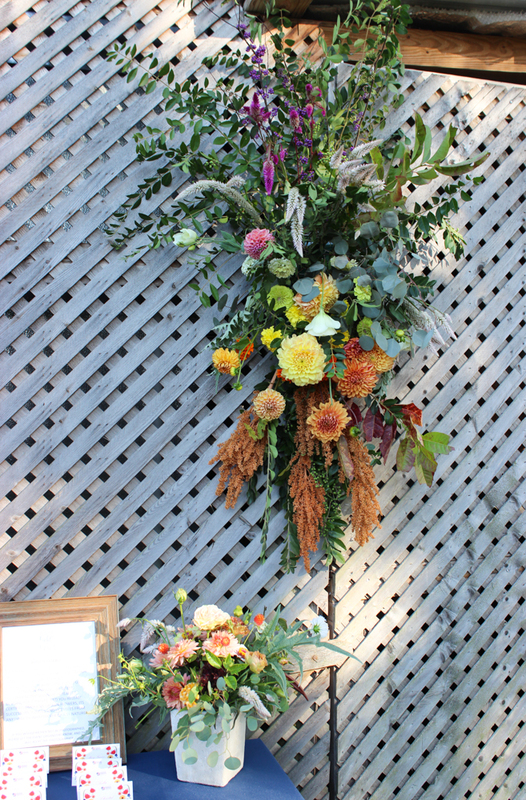 The farm’s lead florist created swags at the entry table. Walking further in, cocktail tables were set amongst three drink stations serving local beer and wine and signature flower-themed cocktails. 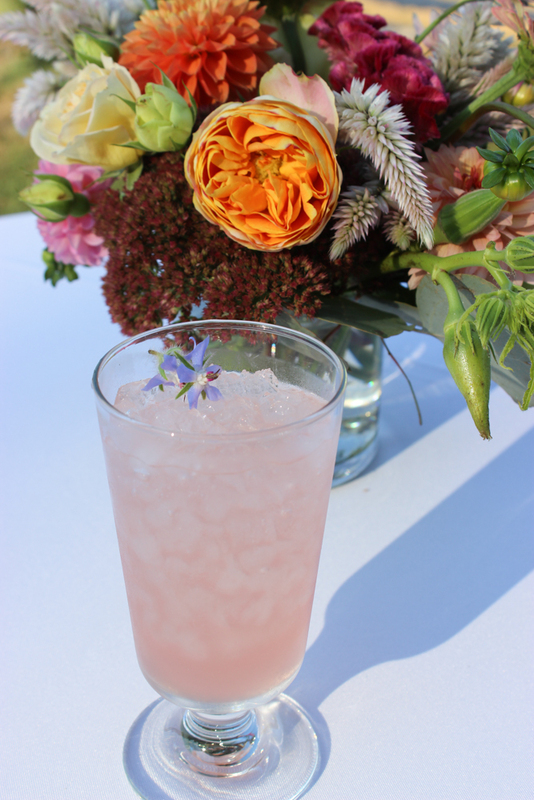 Guests could enjoy their drinks, tour the farm, or stop at the boutonniere bar to create their own special piece. The dinner itself was amazing. 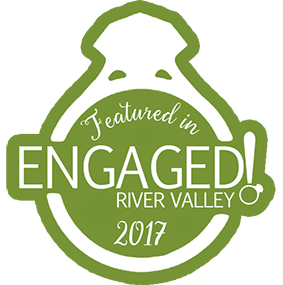 The food was delicious, a fabulous band played and I enjoyed conversation with guests around me from four different states. 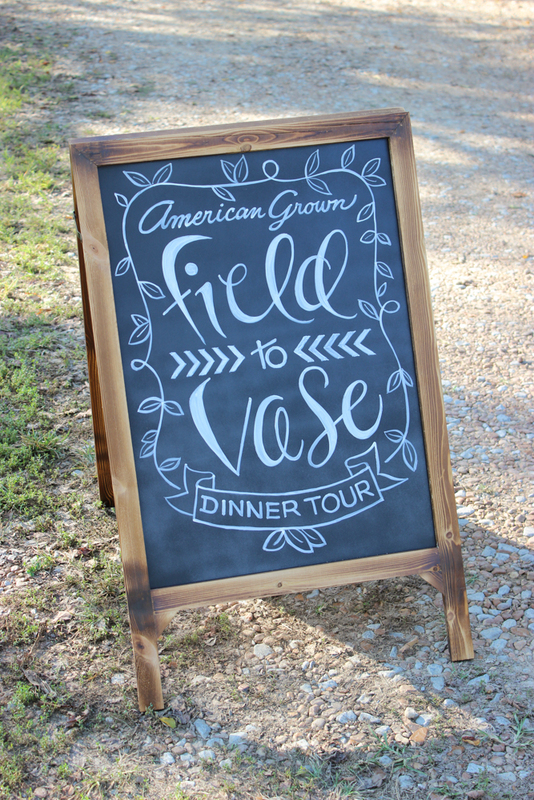 If you ever have the chance to attend the Field to Vase Dinner tour, I highly recommend it. You can visit their website or Facebook page for information on next year’s tour. If you would like someone to attend with you, let me know. 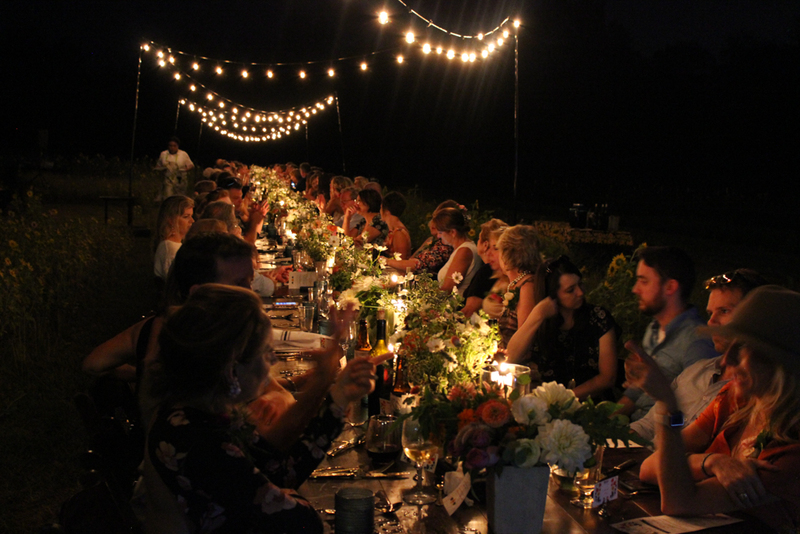 I would love the chance to experience the dinner again. 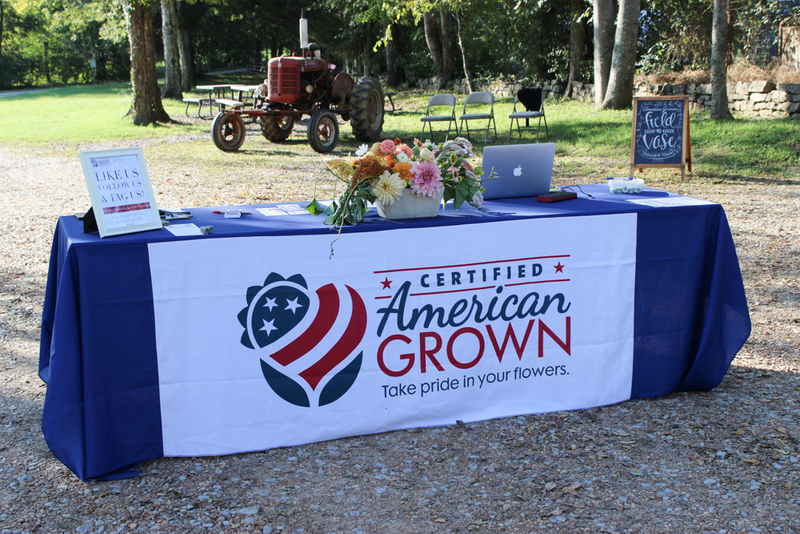 Thank you to American Grown Flowers for all of your work promoting the domestic flower industry, to Green Door Gourmet for opening up your farm, and to Team Flower for the opportunity to design with you. It was a very memorable experience.